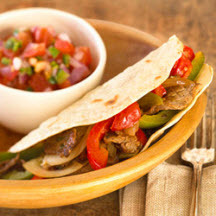 CooksRecipes has quality, kitchen-tested recipes for a large variety of fajitas that you can count on for successful deliciousness. A good long soak in this lime-salsa marinade will make a semi-tough cut of beef, such as flank steak, tender and terrific. 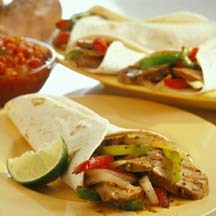 Have warm flour tortillas, sautéed onions and bell peppers, and your favorite salsa to go along with this dish of marinated and roasted pork tenderloin, fajita-style. 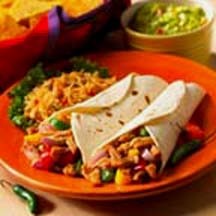 Fast and tasty stir-fried turkey fajitas with three colors of diced bell pepper, red onion, garlic and jalapeño combined in a tomato salsa and served in warm flour tortillas.